iOS games have really evolved yet the retro runner seems to always be in style. Pixels with midi music are definitely back in. 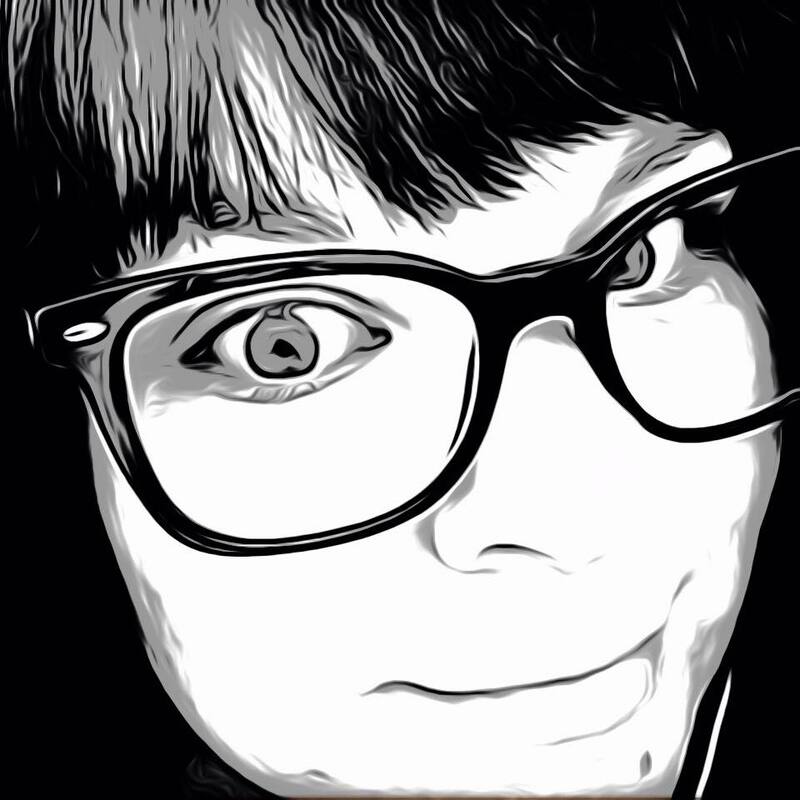 Add a creative concept and your app could be the next Flappy Bird. Run-Cal, by Sandeep Jayendran, keeps true to the retro game style while promoting a healthy eating message. Run while you have fun! Trying to be fit in real? Start with Cal. He’s on the run and has pledged to eat only healthy food! • While you are at it, make sure Cal only eats the good food and not the junk! It’s easy, it’s fun. Just RUN! 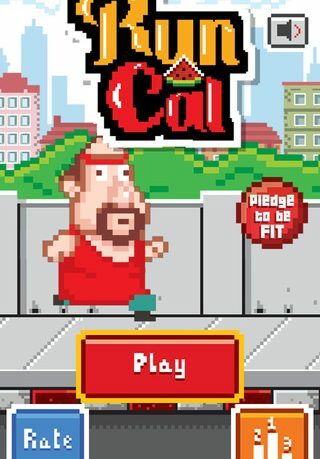 Begin as Cal, an overweight, balding, older man in work out clothes, trying to make a change and start eating healthy. 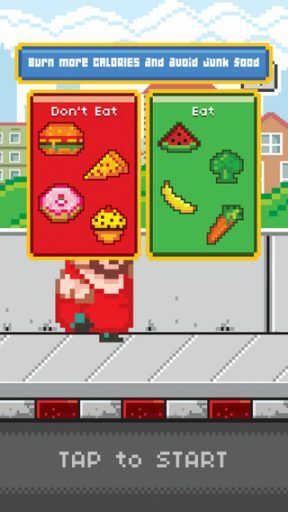 To play the game, just tap the screen to move Cal from one side of the sidewalk to the other, avoiding any unhealthy junk food like donuts and pizza. Gain points the longer you can run without touching the junk, and collect as many fruits and vegetables as you can. Pretty simple, right? Not quite. At first, when I began to play Run-Cal I was a bit confused by the description. Was I suppose to run while I played? In fact, no. Instead I think it is used more as a training to teach you to be healthy. Or maybe it was just a fun concept that had nothing to do with the player becoming healthy at all. 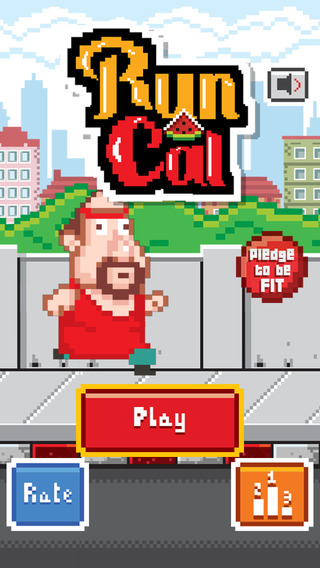 Though there is a button you can press on the main screen that says, “Pledge to be FIt.” Not really sure what the true message is here, but what I do know is if Cal touches a donut, even a smidge, the game is over and you start again. The level isn’t even anything you can memorize as it just changes every time. My highest score I only achieved because it just happened that all of the healthy food appeared on the right of the sidewalk and I didn’t have to move Cal for quite a while. Like a lot of runners, you have to be quick and focused. Unfortunately you only get one try before it’s back to the beginning. It can get repetitive and there are ads that can last up to five seconds between games that can also be a turn off. The game is free though and an in-app purchase will remove all ads. Run-Cal may be a simple concept, but if the drive is there it can become addicting. Run-Cal is available for free in the App Store and is compatible with iPhone, iPad and iPod Touch.